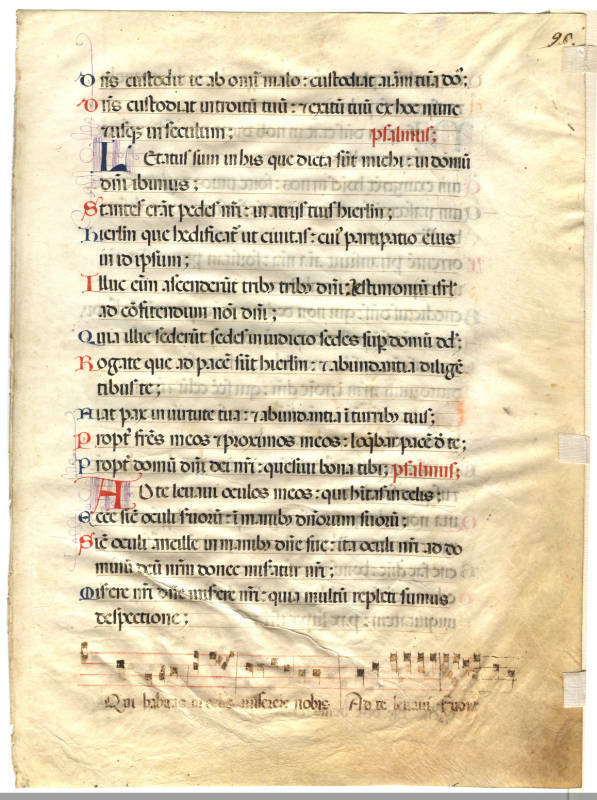 Text: Psalms 120:7-122:3 (recto); Psalms 122:4-124:5 (verso). Dóminus custódit te ab omni malo; custódiat ánimam tuam Dóminus. Dóminus custódiat intróitum tuum et éxitum tuum, ex hoc nunc et usque in saeculum. 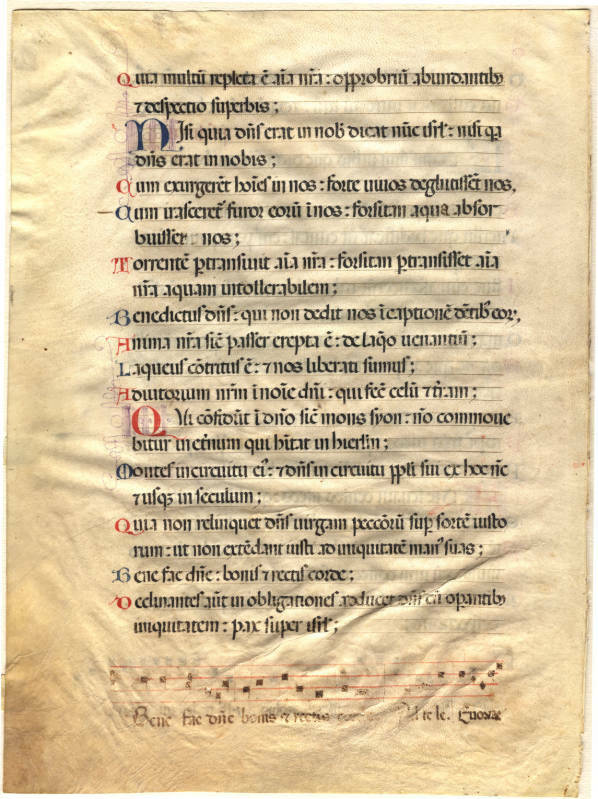 Psalmus. Stantes erant pedes nostri in átriis tuis, Jerúsalem. Jerúsalem, quæ ædificátur ut cívitas, cujus participátio ejus in idípsum. Illuc enim ascendérunt tribus, tribus Dómini: testimónium Israël, ad confiténdum nómini Dómini. Quia illic sedérunt sedes in judício, sedes super domum David. Rogáte quæ ad pacem sunt Jerúsalem, et abundántia diligéntibus te. Propter fratres meos et próximos meos, loquébar pacem de te. Propter domum Dómini Dei nostri, quæsívi bona tibi. Psalmus. Sicut óculi ancíllæ in mánibus dóminæ suæ: ita óculi nostri ad Dóminum Deum nostrum, donec misereátur nostri. 7 The Lord keepeth thee from all evil: may the Lord keep thy soul. 8 May the Lord keep thy going in and thy going out; from henceforth now and for ever. Psalm. I rejoiced at the things that were said to me: We shall go into the house of the Lord. 2 Our feet were standing in thy courts, O Jerusalem. 3 Jerusalem, which is built as a city, which is compact together. 4 For thither did the tribes go up, the tribes of the Lord: the testimony of Israel, to praise the name of the Lord. 5 Because their seats have sat in judgment, seats upon the house of David. 6 Pray ye for the things that are for the peace of Jerusalem: and abundance for them that love thee. 7 Let peace be in thy strength: and abundance in thy towers. 8 For the sake of my brethren, and of my neighbours, I spoke peace of thee. 9 Because of the house of the Lord our God, I have sought good things for thee. Psalm. To thee have I lifted up my eyes, who dwellest in heaven. 2 Behold as the eyes of the servants are on the hands of their masters, As the eyes of the handmaid are on the hands of her mistress: so are our eyes unto the Lord our God, until he have mercy on us. 3 Have mercy on us, O Lord, have mercy on us: for we are greatly filled with contempt. quia multum repléta est ánima nostra oppróbrium abundántibus, et despéctio supérbis. Torréntem pertransívit ánima nostra; fórsitan pertransísset ánima nostra aquam intolerábilem. Benedíctus Dóminus, qui non dedit nos in captiónem déntibus eórum. Láqueus contrítus est, et nos liberáti sumus. If it had not been that the Lord was with us, let Israel now say: 2 If it had not been that the Lord was with us, When men rose up against us, 3 perhaps they had swallowed us up alive. When their fury was enkindled against us, 4 perhaps the waters had swallowed us up. 5 Our soul hath passed through a torrent: perhaps our soul had passed through a water insupportable. 6 Blessed be the Lord, who hath not given us to be a prey to their teeth. 7 Our soul hath been delivered as a sparrow out of the snare of the fowlers. The snare is broken, and we are delivered. 8 Our help is in the name of the Lord, who made heaven and earth.